Yesterday we attended the first session of the annual conference of the Global Competition Law Center (of which, btw, Nicolas is the director). As expected, the conference was extremely interesting, and gave us plenty of ideas for future posts. Here´s one. Our friend Damien Gerard made a very good presentation in which, following a historical approach, he presented several paradoxes of the modernisation of EU competition law. After he concluded, I posed a question to the panel, asking whether the interplay of the three dimensions of modernisation that Damien mentioned (substantive, procedural and institutional) may have had the effect -or perhaps the object..- of killing Art. 101(3). The comments that followed showed that this is a widespread concern. In the early days of the classic case law, EU Courts paid great attention to Art. 101(3) because they were conscious of the crucial role that the drafters of the Treaty had attributed to this provision. But it wasn´t their task to apply it. They saw it as something too complex and abstract, so they washed their hands off: they left its application up to the Commission and decided to apply a light standard of review. That is, in fact, where the “manifest error of appraisal” test of judicial review was born for EU competition law. For many years, the Commission exercised its monopoly over the application of 101(3). Those were, in a way, the “golden days” of this provision (even though there were some obvious disfunctionalities as a consequence of the centralized system). With the entry into force of Regulation 1/2003 this whole situation changed. The Commission shifted its priorities to focus on the “most serious infringements” which, as a matter of fact, are also the “most obvious” ones. It therefore also washed its hands and left the cases where Art. 101(3) would be relevant to national competition authorities (NCAs) and national courts. But NCAs and national courts also regard the application of 101(3) as something which is too complex, and, let´s face it, the Commission´s Guidelines on Art. 101(3) are far from being decisively helpful. Couple that with the feeling that undertaking an effects analysis under 101(1) is also too burdensome, as well as with the fact that NCAs have, logically, their own priorities, and what you get is a situation where at the national level there are essentially only “object cases” where 101(3) assessments are reduced to an absolute minimum under the argument that “object restrictions” are hardly redeemable (which, btw, is at odds with all case law departing from European Night Services) There are no available stats on this, but I bet they would be mindblowing. The Commission hasn´t done much to solve this situation. It has failed to provide case by case guidance, and has instead focused on sanctioning cartels, abuses of dominance (mostly in network industries) and in releasing general guidance; moreover, where an issue appears as uncertain, the usual solution is to adopt a commitment decision. Not really helpful. Furthermore, the Commission has contributed to fostering the confusion by enlarging (with the help of EU Courts) the “object” category (e.g. with regard to information exchanges). EU Courts, on their part, could also be charged as accomplices. Three pieces of incriminating evidence are (i) the enlargement of the “object” category in T-Mobile; (ii) the ruling in Tele 2 Polska precluding NCAs from adopting negative decisions; (iii) the adoption of distinct standards for the review of 101(3) assessments: would the overly simplistic Premier League Judgement, where the Court says, without providing much support for its assertion, that the exclusivity arrangements at issue do not meet the conditions of Art 101(3) (see para 145 of the Judgment) comply with the Court´s tough stance against the Commission in Glaxo Spain? In my view, this situation is dramatic for EU competition law (well, as dramatic as a legal matter in the competition law field can get, which, to be frank…). The interplay of all the factors above has led to an overly simplistic view of competition law, to a shifting of the burden of prove, and to even more arbitrariness and uncertainty. PS. 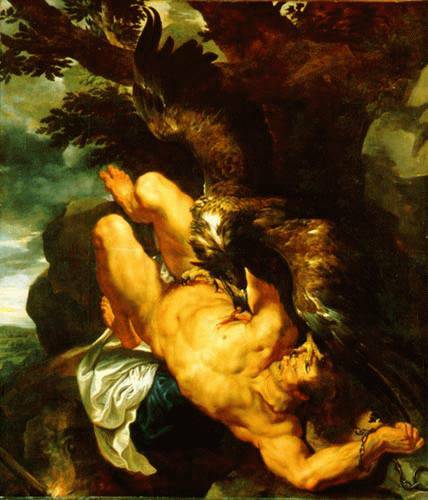 The painting illustrating the post is “Prometheus bound” by Rubens. As Art. 101(3) in the world of competition law, Prometheus was “credited with -or blamed for- playing a pivotal role in the early history of mankind“. As you know, immortal Prometheus was punished by Zeus to a -quite nasty- eternal punishment: he was bound to a rock where his liver was eaten daily by an eagle, only to regenerate and be eaten again the following day. Mithology has it that Hercules finally slayed the eagle and freed Prometheus. Will anyone eventually free Art.101(3)? As always, I have to take the role of the Devil’s advocate here, as your opinions guys are quite skewed. I hope you concur with me that under a self-assessment regime it is up to the defendant to raise the case for individual exception under art. 101(3), but in so doing the defendant would have to implicitly concede that the agreement may be in breach of 101(1). That is to say, far from being NCAs to be reluctant to adopt 101(3) decision it is the defendants that do not come forward with good cases. The UK OFT had the idea to experiment with short form opinions, which was a way to give guidance on how to apply 101 in novel circumstances, without formally reaching a conclusion that the agreement was in breach of 101 or needed individual exemption being in breach of 101(1). Well, as it turns out, no second opinion has been issued since April 2010. So i guess there is an elephant in the room that you just missed out among the usual suspects there. Thanks Paolo for correcting our skewed opinions and for contributing to the debate with such valuable input. – Self assessments end whenever a competition authority intervenes. It is therefore not correct to refer to ‘defendants’ in self assessment scenarios. A defendant only exists when an accusation is brought against it. – It is not up to defendants to “come forward with good cases”. That’s the enforcer’s task. Under an enforcement system where the administration sanctions companies, it is for the administration to raise a compelling theory of harm that calls for intervention. It is only then that it is up to defendants to raise a defense under 101.3. – If what you are trying to say is that lawyers and companies are not good enough at putting forward solid 101.3 arguments, then you can of course include lawyers amongst the usual suspects. That’s a very valid and respectable opinion although, frankly, I think it is quite skewed. Let me get this right: in your view, the big elephant in the room that we fail to see is that lawyers and companies are acting against their interests by curtailing their only possibility of defense. Is that it? The way I see it, that would not only make little sense but also, judging from my own experience, it is quite far from being true. For precluding any confusion, Nico is only joking. Of course we don´t keep keep score of these things, and we are thankful for comments and input, not less so because sometimes we simply intend to spur debate and it may even be true that our opinions are skewed. The moment when we blame “defendants” for not justifying enought their practices under “self-asseessment” regimes thats´when we have to check whether we´re interpreting or applying the system properly. It´s dangerous to assume that eveyone is in principle under an accusation, and that if they fail to rebut that accusation it´s only due to their errors. I am not kidding. Your points are much more convincing than Paolo’s ones. No need to refuge in trite legalistic bickering. Let me put it this way. Your argument seems to imply that Art. 101(3) is on a slow death due to the lack of formal decisions, but you totally missed the point that under a self-assessment regime, art. 101(3) is well alive and kicking every time corporate counsels and external lawyers advise firms on whether their agreement can benefit from individual exemption. With respect with your point that the Commission has failed to provide case by case guidance, combined with your response to my first comment, you are actually expecting that the Commission spot valuable cases where an agreement can be individually exempted (thus diverging resources away from the enforcement of alleged serious infringments) – well, this is ludicrous. Finally, and I repeat, you lawyers seem not at all interested into getting case by case guidance, as witnessed by the fact that none has so far taken advantage of the new procedure launched by the OFT early in 2010. The point is actually this: in a world devoid of individual guidance on 101(3), etc. where standards enshrined in general guidance are overly complex, firms and their counsels are extremely reluctant to apply 101(3), and thus do not avail themselves of the defense provided by the law. The legal system becomes thus increaslingly tough, and may in turn give rise to a host of type I errors, in the language of economists. On guidance, why aren’t 101(3) cases as valuable as cartel cases? Or more generally, why would negative decisions be always better than positive ones? After all, when a CA takes a positive exemption decision, and sets guidance on the conditions for exemption, it symmetrically gives guidance on the conditions under which there is an infringement (and possibly a serious one). Let me add: NCAs know all to well how to run cartel cases. In contrast they may feel less comfortable with new issues arising in grey cases. Would’nt it be more sensible for the Commission to drop cartels and focus on devising the policy in the complex, emerging areas of competition law? Of course Art. 101.3 is alive in self assessments! Otherwise everything would be caught by Art 101.1 (literally, everything) and everything would be forbidden. It never crossed my mind that Art 101.3 may be dead for those purposes. I was assuming that it was too obvious that parties need to be conscious about the existence of that provision to operate daily. I thought it was obvious because I see no conceivable alternative. What I´m saying is that no one other than parties is applying 101.3. And when general guidance is insufficient and no one (with authority and the ability to set precedents, which the parties lack, don´t forget that) is applying this provision, then parties (and judges, and some national competition authorities) have no idea on how to assess their practices. And even if a brilliant and thorough self asseesment is made, that is often of little use, because standards are so blurred that you are left at the expense of the authority´s interpretation of the provision (because the authority enjoys a tremendous margin of discretion that it fails to limit or clarify, which it could do by adopting negative decisions, guidance letters or by adopting more positive decisions in individual cases). Everyone wants more guidance. I don´t know about the details of the OFT´s initiative and about why it hasn´t delivered the expected results. But in the jurisdictions I know it is often very clear that similar systems have obvious flaws which reduce parties´incentives to follow that path. That doesn´t mean companies and lawyers don´t want certainty. How could they not?? I don´t think that the Commission should stop prosecuting cartels, but I do think that the current enforcement mix could be better targetted. The Commission is not just another competition authority; it also bears a “special responsibility”. PS. “Trite legalistic bickering”??? As I said above, semantics are often important because they carry meanings and express prevailing attitudes; and those meanings and attitudes have very important practical consequences. “Legalistic” stuff is also important, and I don´t think that I have to explain why. I have to confess that Im puzzled when some people try to undermine arguments by labelling them as “legalistic”. That is seriously wrong and seriously dangerous. I would like to add a word about the use of decisions and, particularly, opinions as a way of providing guidance on the application of Article 101(3) (or, in UK competition law, section 9 of the Competition Act 1998). The OFT, whose decisions and enforcement practice I know fairly well, issued a couple of fairly short decisions in the early days of the 1998 Act (i.e. in the early part of the 2000s) individually exempting agreements. Since then, it has not done so, although it has considered (and rejected) exemption arguments put forward by the parties in various cases. So in terms of decisional practice, there is not much to go on, so far as positive exemption decisions are concerned. The OFT’s power to issue opinions arose from the amendments needed in the UK enforcement regime in the light of the modernisation of EU enforcement under Reg 1/2003. Some practitioners thought that the OFT might make a fair amount of use of this power. Not so. In fact, aside from the short-form opinion process to which reference has been made in previous comments, the OFT has only ever issued 1 opinion, in October 2008, concerning newspaper and magazine distribution (http://www.oft.gov.uk/shared_oft/reports/comp_policy/oft1025.pdf). Without going into the detail, the final opinion followed in the wake of 2 draft opinions, both of which employed different analysis and came to different conclusions. Quite why the OFT needed 3 bites at the cherry and several years to arrive at a settled position is a good question, but in any event it is fair to say, I think, that it was a chastening experience for the OFT, and one which was very resource-intensive. It is not one which the OFT will wish to repeat in a hurry, if ever. Further, whilst the final opinion contained a lot of useful analysis, it was cast at a relatively high level – it did not seek to apply the analysis to any of the individual distribution agreements in this sector. The OFT was clearly sensitive to criticism from business and lawyers that there wasn’t enough guidance coming out of the authorities and that potentially beneficial collaboration was being stifled as a result. The answer was the short-form opinion process, which was put into place about 2 years ago. Requests for such opinions must satisfy various conditions, in particular that the request must concern a concrete prospective agreement (not a hypothetical agreement) and it must relate to novel or unresolved questions concerning the prohibition on anti-competitive collusion. In general, this was viewed by practitioners as a positive development, albeit of more limited value than a fully reasoned decision applying the law, including exemption criteria, to the facts of a particular agreement. As has been mentioned, the OFT has issued 1 opinion so far, namely in relation to a joint purchasing agreement (April 2010): see http://www.oft.gov.uk/OFTwork/competition-act-and-cartels/short-form-opinions/. Why there haven’t been any more can only be a matter of conjecture, absent information from the OFT itself. Is it because the right sorts of requests haven’t been made? Is it because the OFT wishes to prioritise other work? It certainly cannot be inferred, as I understand Pablo Siciliani to be saying, that the absence of other short-form opinions is due to parties not requesting them. And even if that is the (or one) reason, it does not shed any light on why parties are not requesting them: for instance, some parties may not wish the world to know about their prospective agreements, which may be commercially sensitive, including in circumstances where they parties decide ultimately not to proceed. Requesting an opinion from the OFT puts such sensitivity at risk.